So yes, there are tons of hotels with decent views scattered across all sorts of places and yes, they might make you happy for a while, I guess, and it's all good, but not really in the jaw-dropping whoa-what-happened-to-my-eyeballs kind of way. Ritz Carlton, Hong Kong, 112th floor. It's insane. And they do have that brilliant outdoor jacuzzi on the 118th floor, too. This is one of the two onsens I keep returning to whenever I'm in southern Japan. An absolute favorite despite being located smack in the middle of a resort. The location and a couple of insanely hot onsen tubs and a a few slanted stone plates soaked in hot water makes this an incredibly nice onsen experience, well worth a detour to Iojima island, just outside Nagasaki. A few years ago a second onsen option was added, the Shimakaze No Yu. And I have yet to try it. 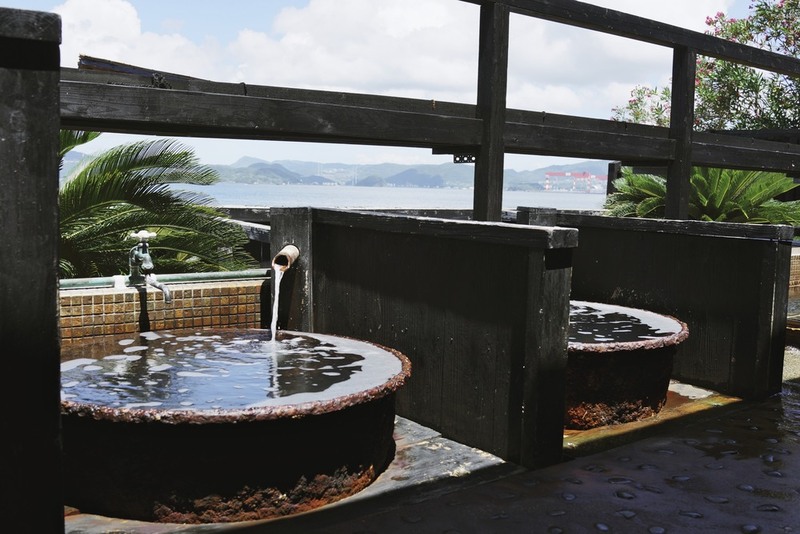 This section covers the other, original onsen option – the Yuyu. Indoor facilities are quite decent with a nice and relaxed ambiance. Onsen Soaker, a really great onsen blog, has a pretty good description of the range of indoor pools available. A nice and uncommon touch is the section where hot onsen water is pouring down on you from above, not a bad experience at all. Despite not being all that big the place is usually not that crowded, except on weekends. The onsen is part of a resort spreading out along the coastline of Iojima Island, and when you walk up to the onsen section it does feel slightly closer to your average holiday resort than a proper, old-school onsen location. But once you get inside the onsen it's all back to where things should be in terms of a proper, classic experience. What really sets this place apart is the outside section. Sliding the glass door open you step out onto a three-part terrace featuring a decent outdoor onsen pool, a slanted set of stone plates to be relaxed upon, and a couple of tiny mini-tubs. Beware though – the slanted plates are only available in one of the two gender separated sections (the male/female sections are swapped every day, I believe). The slanted stone plates are pretty amazing. Spend some time in the onsen pool, walk over to the set of stones, lay down, eyes towards the sky. And feel the hot water trickling down your back. I find it to be an incredibly relaxing, mesmerizing experience and have sometimes been stuck for hours doing nothing but watching clouds bass by. The killer feature of this onsen, however, is the set of three tiny tubs. Each barely having enough room for a single person, with hot onsen water constantly floing into it. A regular onsen pool is mighty hot at around 41°C or so (106°F), but the water flowing into these tubs is crazy hot. They used to have a setup where the water in each tub would be, in order of increasing insanity, incredibly hot, mega super hot and downright boiling. But that was changed a few years ago into a customizable temperature setup for each individual tub. The almost-boiling water flows right into the tub and a separate cold water tab allows you to adjust the water temperature to your preference. I typically shut off the cold water tab entirely going all in on the crazy hot water and seriously, this stuff gets my brain into a weird place where the sensation of tranquility an relaxation is absolutely insane. Ordinary onsen temperatures never get me there and... it's nuts. And I love it. If you happen to be in Fukuoka, getting to Nagasaki is a breeze. It's an easy two-ish hour journey with the Kamome Express and makes for good day trip. The train ride is of the slower, relaxed cross-Kyushu variety and allows for plenty of time to ponder what thoughts may cross your mind while enjoying a bento box purchased at Hakata Station before boarding. When in Nagasaki, exit the station, make a right and find your way to the ferry terminal – it's easy to get to once you know where to go. There's a distinct building nearby with a giant yellow ball on top of it. A department store with a Starbucks and a couple of restaurants are right next by too (not a bad place to get a decent meal before catching the ferry). Once you get inside the terminal (pic above), head for the ticket machine (pic below), get yourself a return ticket for Iojima (should be around ¥1,300) and board the next ferry. Having boarded the ferry, go upstairs and out on deck, weather permitting. It's a nice and brief journey and before you know it you'll be on Iojima. Give the appropriate ticket to the staff when disembarking, then do a five minute walk to get to Yasuragi Iojima. Enter the resort premesis, ask for the onsen facilities (the Yuyu one if you want to experience what's been described above) and they will happily point you in the right direction. 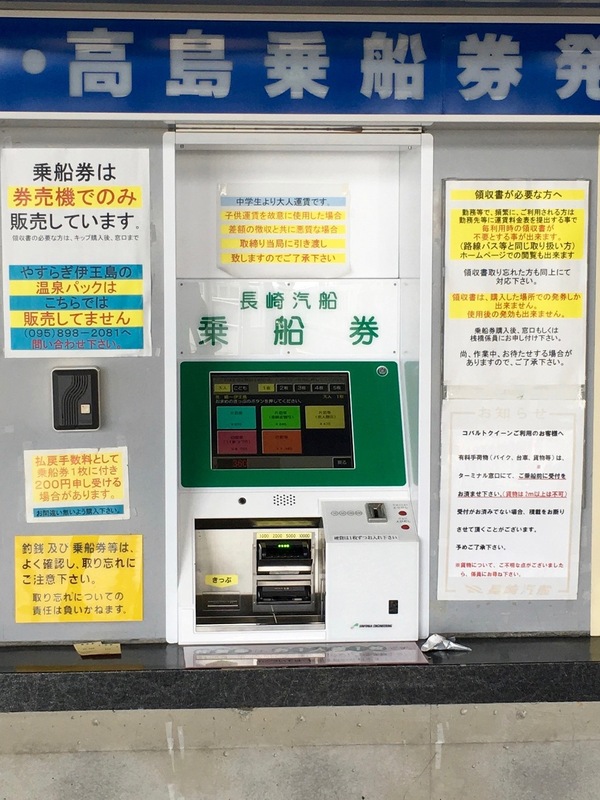 Take off your shoes, buy a ¥750 onsen ticket using the machine to your left, hand the ticket to the staff and in return you will get a small towel. That's it. Now go nuts with the onsen tubs. Ferry time table (pdf, as of June 2016). The black left-most column has departure times from Nagasaki, the right-most red column has departure times from Iojima back to Nagasaski. I first found this place through Onsen Soaker. Great review and helpful instructions on how to get there, really appreciate her efforts exploring onsen territory throughout Japan and beyond.